Boggs (b. 1915) draws on her decades of activism in many of the humanizing movements of the twentieth century. She and her late partner James Boggs moved to Detroit in 1953, and she has rooted herself there since. Boggs’ interconnected topics here include her work in Detroit building a city of hope from the ruins of disinvestment, redefining revolution in the face of current crises, Malcolm X and Martin Luther King, and education. Boggs argues that we are in a post-industrial age, when we can no longer depend on the state—previously swollen with the spoils of empire—to meet our needs. In fact, she writes, “it becomes clearer every day that organizing or joining massive protests and demanding new policies fail to sufficiently address the crisis we face. They may demonstrate that we are on the right side politically, but they are not transformative enough.” Instead, she envisions people transforming themselves from victims of injustice to people who are actively choosing to participate in their communities, increasing their capacity for self-determination. I remember the first time I met Grace. I was 21, spending the month before I moved to New York City in the Detroit area. I had already been inspired reading her autobiography, Living for Change. She and others at the Boggs Center took me to Catherine Ferguson Academy, where young pregnant women and mothers are able to learn in an environment that nurtures their whole selves, to community gardens where people were growing the nutritious food that they couldn’t otherwise access in the city—and she let me sit quietly in a corner in her home during lively debates on education reform. They showed me the decrepit skeletons of formerly bustling factories, the detritus of what once was the “arsenal of democracy,” now the harbinger of a post-industrial America. Then, arriving in New York City—not only not a symbol of urban decay, but in many ways the center of a dynamic finance and real estate-driven economy—I struggled with how to apply the lessons I had learned in Detroit to this seemingly disparate context. 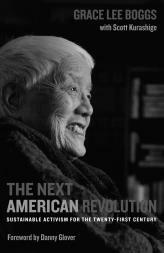 Now, reading Next American Revolution after several years of grassroots community-organizing experience, I’m struck by how much we can learn from Grace Boggs. Her overarching message is that what we need is a paradigm shift in values—building alternative institutions “toward a solidarity economy whose foundation is the production and exchange of goods and services that our communities really need”—and a shift away from an education system that views young people as “cogs in the economic machine” and towards one that engages them in community-building and real world problem solving. She faults movements that focus on “squeez[ing] the last drops of life out of a failing, deteriorating, and unjust system… instead [of] devot[ing] our creative and collective energies toward envisioning and building a radically different form of living.” She cites health care reform organizing that focuses on “feeding the monstrous medical-industrial complex” as one such negative example. Less persuasive are some of the examples that Boggs cites as positive alternatives. In particular, she points to the growing number of community-based development corporations and nonprofits to support her ideas. Many of us, however, who have had even limited experience with these formations know that they can often reproduce the top-down structures that she rails against and have little (if any) investment in pushing for grassroots community engagement. Also unclear is Boggs’ view of how to build a movement to scale. She might reply that that’s the wrong question to ask—but anyone who is concerned about the urgent need to confront the “triplets of materialism, militarism, and racism” needs to address how we can create transformative organizing vehicles of not just thousands of people, but millions. And that is a task that requires not only local struggles as the foundation, but a movement that is operating on a national and international level, with coordination and shared strategy. But these are questions that can and should be debated. Less a blueprint for organizers and more a vision for transformation, Next American Revolution is a book that asks us the necessary question, “What does it mean to be a human being in the twenty-first century?” And in our subsequent discussions and work, we might find some answers that will lead us to the next stage in our mental, social, and spiritual evolution.